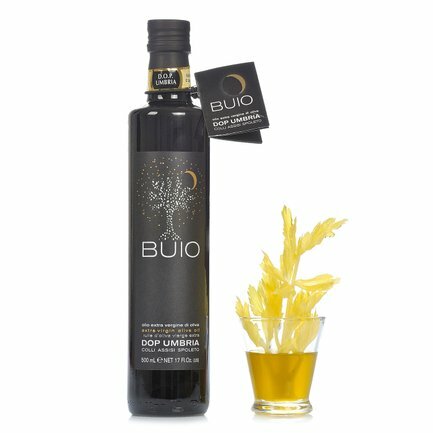 Buio isCufrol's own extra virgin olive oil that has conquered the attention of Italian and international palates thanks to its great organoleptic properties that comes from a particular production process. The production and bottling is in fact carried out in the absence of oxygen thus guaranteeing almost perfect conservation of the original oil. Buio, "dark", is also the name that identifies the packaging of this oil aimed at protecting it from the light. Its dark and opaque anti-UV glass also has a modern minimalistic and elegant design. Refined, complex and mildly pungent, Buio is the perfect oil to have on your dining table. Cufrol is located in Spoleto, Umbria, and was created by an association of a few entrepreneurs that owned antique oil mills in the region. Their passion and hard work in the production of extra virgin olive oil has allowed them to create a centralised bottling and storage facility following in the tradition of Umbrian quality. Cufrol also produces extra virgin olive oil from organic olive groves. The determination and constant search for excellence has meant that Cufrol extra virgin olive oils are used in the kitchens of the most well-known chefs.